Welcome to my blog! I am one of those people who always seems to have my cart in front of my horse. It is very annoying, but I usually get things straightened out! I wanted to share my silly adventures, so I hope you enjoy. I have been on a mission to finish our home that has been at a stand still for a few years, and seriously I decide to start a blog? Yep..really. The past few weeks have been CRAZY. I have created quite the mess as you can see. The thing is…I need to tear out to create something new. I have wanted a sewingroom for a very, very long time, and…I hate dragging machines out to the diningroom and having to put it all away. Seems to me it takes time away from doing what I love…sewing. So, I have proclaimed war on my home and the battle is well under way. 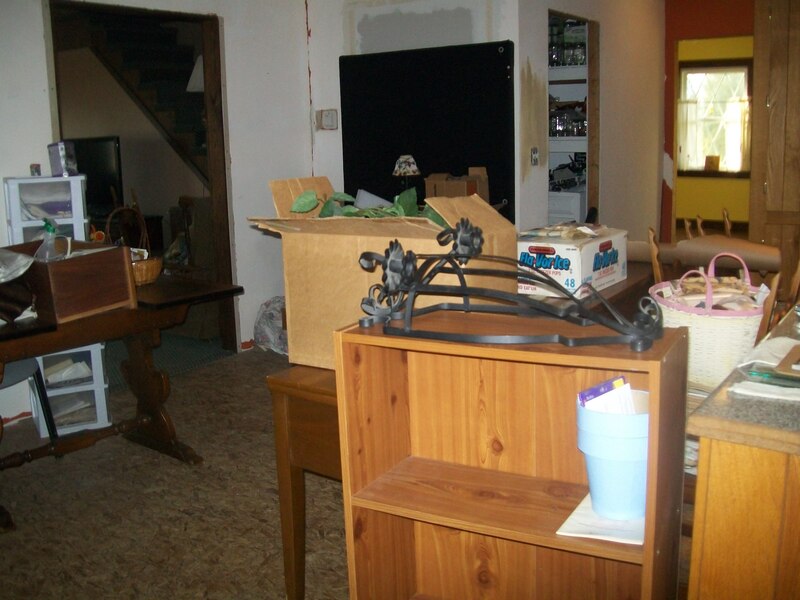 This is my furniture piled into the kitchen waiting for their new home to be complete. I have painted the walls, ripped up the carpet, and put down a contractor paper floor. Yes, I tell you. I have put paper on the floor. 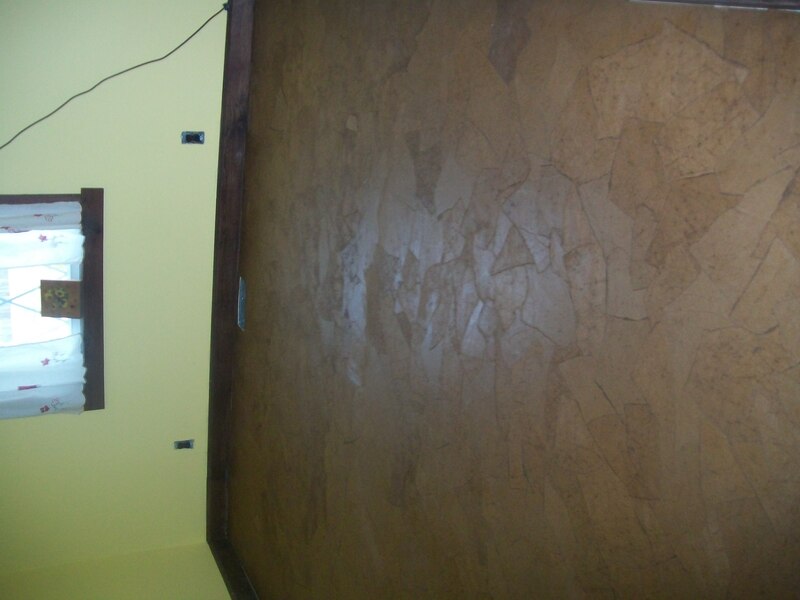 The floor idea is something I did to my master bath walls a few years ago, but I never dreamed of putting it on the floor, but thanks to Pinterest, it is now on my floor! I decided to lay underlayment board, and finish the seams before I put the paper down and I paid my wonderful nephew to do the job, so that added $110. But, I am hoping to wrap this whole project up in under $300, paint and all. 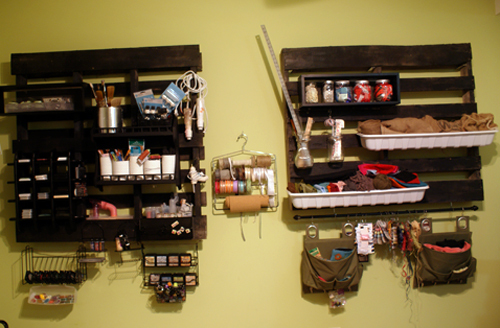 The next step is will be to add pallet shelves… another inspiring idea from Pinterest. Isn’t this WONDERFUL!? Well, I think it is! It is cheap and functional!! The “How to” on it…http://savedbylovecreations.com/2012/06/budget-friendly-craft-room-storage-solutions.html Thank you sew much SBLC!!! I can’t wait to put my own version of this on my freshly painted walls! Well, friends, it seems I have some waiting to do, but have no fear, I will get this done and continue to create wonderful things in my new sewingroom to share with you! This entry was posted in Uncategorized on February 19, 2013 by Susie. Thanks, Johnnie! I’m so happy I found your site!! You made my day when I found the pallets! When I finally get it all together, I will happily let you know and post the pics. The anticipation is wild, but I have wonderful sites, like yours, to visit to keep me busy.